Ooty is one of the most beautiful hill stations in India endowed with extraordinary scenic beauty with a pleasant climate. In this article, I gave an account of its location, how to reach this amazing hill station and the various best places to visit around Ooty. Ooty is popularly known as Queen of Hill Stations. It is also known as the Blue Mountains and is one of the most beautiful hill stations located in South India. It is one of the finest summer resort where the climate is chill and cool even in summer. Ooty is located about 7,500 feet above Sea level. The mountain range found in this region is popularly known as Nilgiri Mountain region. Ooty is exactly located in the tri-junction of three states Karnataka, Tamilnadu, and Kerala. Ooty became so famous because of its excellent scenic beauty and climatic conditions. Towering mountains, sprawling tea gardens, splendorous Flower Gardens, nature's gift of greenery everywhere, a beautiful climate with raining clouds all the time, amazingly awestricken lakes is the way one can describe the beauty of Ooty. Ooty is an amazing tourist destination which has its charm and glory throughout the year as well as in all the seasons. But the most ideal time to visit Ooty is from March to June. It is the summer season all over India but in Ooty, the temperature never raise beyond 20 degree Celsius. So the climate is very pleasant for sightseeing during this season. July to September is monsoon season in Ooty where it receives heavy rains. Even though this season is little bit discomfortable to go out to visit various places but nature becomes an eye feast for all the tourists. October to February is the winter season in Ooty where nature appears to be at its best in this season. Nilgiri Mountain Railway: The Nilgiri Mountain Railway was built in 1908 by British is identified as World heritage site. This 1000 mm Meter gauge train in India. A Toy train travels between Mettupalayam to Ooty. Traveling once in the Ooty Toy train is a lifelong remembering event for every tourist of Ooty. The Train starts at 7:10 AM in Mettupalayam and reaches Ooty in five hours. Traveling in this Toy train provides a breathtaking experience of traveling through tunnels, curves, bridges, beautiful scenery to reach Ooty. But the ticket availability to travel in this Toy Train is very limited. So you have to book in advance in IRTC in order to make sure to travel in this train. The return train from Ooty to Mettupalayam is at 3 PM. The ticket fare to travel in this Toy Train is Rs.24 in Second class and Rs.142 in First class. Ooty Lake: Ooty is a most amazing tourist spot in Ooty tourism. It is located in Nilgiri district of Tamilnadu 1 Km. away from the city center. Ooty lake stretches in an area 65 acres. 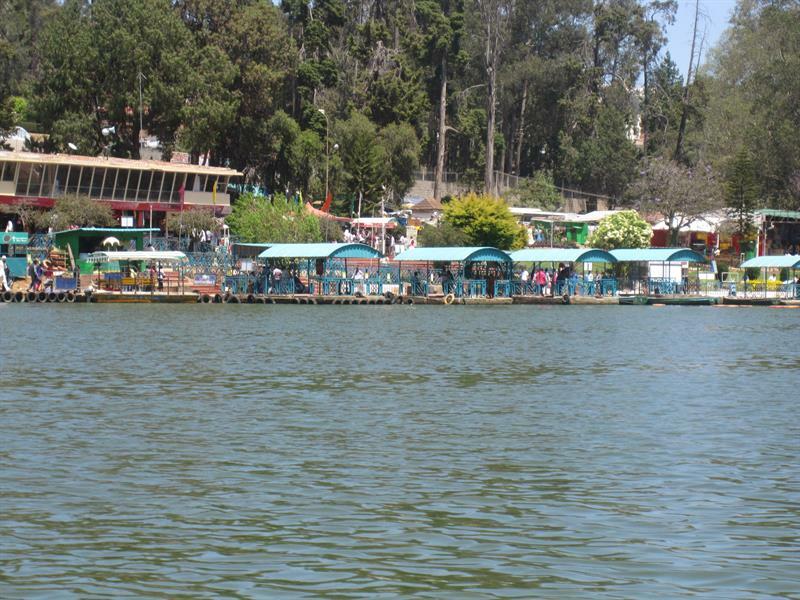 Boating facility is provided to this lake is the major tourist attracting factor of Ooty tourism. This beautiful lake is surrounded by a canopy of Eucalyptus trees and on one side of the shore, we can view a railway line running with trains. Beautiful birds flocking over the lake give a spectacular view to the visitors. The Boating House provide Paddle Boats, Motor Boats, and Row Boats for the visitors to enjoy in the lake. During the summer season in May boat races and boat, pageantry was organized for two days which will be an eye feast for the visitors. The Ooty lake is having a beautiful garden, a mini train, and amusement park. The Boat House will be opened for visitors from morning 9 A.M. to 6 P.M. in the evening in all days of the week. The entry fee for this place is Rs.10, Rs.20 per still camera, Rs.125 per camcorder, Rs.180 per 2 Seater rowboat for 30 minutes, Rs.200 per 4 seater pedal boat for 30 minutes boating. For inquiry Phone No: 91 4232443977. Thread Garden, Ooty: It is one of the most popular tourist spot located very close to Ooty Lake. This Artificial flower Garden has plants, leaves and flowers made up of thread and which looks to be like real plants, leaves, and flowers. All these exhibits were made manually by expert hands so skillfully which looks like real leaves and flowers. For making these things even needle or any kind of machine were used by these skillful experts. You can even buy this beautiful and exquisite collection of artificial plants and flowers from the shops which sell them here. This is the only such Garden which is elsewhere present in the World and one cannot miss to visit it. The Thread Museum will be opened for visitors from morning 9.00 A.M. to 5 P.M. in the evening in all days of the week. Ooty Botanical Garden: Ooty Botanical Garden is one of the oldest Botanical Garden in India. It is one of the popular and famous tourist spot centers in Ooty tourism. It is located 2 Km. away from the Ooty City Center. The Botanical Garden is lush green with an amazing variety of flora, herbs, shrubs, trees, lush green lawns, bonsai plants, and flower beds. The garden is housed with thousand species of plants which include both exotic and indigenous plants. In this garden, we can see a 20 million-year-old fossilized tree. This Botanical Garden is situated in 22-acres of land and is maintained by Government of Tamilnadu Horticultural Department. Nature lovers cannot miss visiting this heavenly abode of Botanical Garden. The Garden will be opened for visitors from morning 7 A.M. to 6.30 P.M. in the evening in all days of the week. The entrance fee for children is Rs.15 per head, Rs.30 per adults, 50 per camera for still photography, Rs.100 for camera video-graph. For inquiry Phone No. 91 4232442545. Ooty Government Rose Garden: It is one of the largest Rose Garden in India situated 2 km. away from Ooty city Center. It is situated in a 4 hectares land on the slopes of the Elk Hill in Vijaynagaram of Ooty town. More than 20,000 varieties of roses of 2,800 cultivars are grown in this garden. The collection of rose plants include Miniature Roses, Hybrid Tea roses, Polyanthas, Papagena, Floribunda, Ramblers, Yakimour etc. Roses of unusual colors of black and green can be found in these varieties. There is a beautiful viewpoint present in this park called Nila Madam from where one can view the entire park. The Garden will be opened for visitors from morning 8.30 A.M. to 6 P.M. in the evening in all days of the week. The entrance fee is Rs.25 per head, 30 per camera for still photography, Rs.75 for camera video-graph. Doddabetta PeakIt is 10 Km. away from Oooty Bus terminus. Doddabetta Peak is the highest peak in the Nilgiri which is at a staggering height of 8650 feet. Doddabetta peak is the meeting point of Western and Eastern Ghats. We can have a Bird's eye view of the entire Coimbatore and the surrounding areas from this mountain peak. Tourism Department of Tamilnadu has arranged a Telescope House here for the visitors to have a Bird's eye view of the beauties of Nilgiri hill ranges. In all weekdays one can use this Telescope view House from 7 A.M. to 6 P.M. by paying Rs.5 person. Sim's Park: Sim's Park is an exotic natural garden spread over 12 hectares of land situated 15 Km. away from City Center. The park has amazing flower beds, lawns, beautifully decorated rockeries, lush green lawns, graceful looking tall trees and flower blossoming herbs and shrubs. Many of the herbs, shrubs, and trees which are not found elsewhere are found in this park. Annually Fruits and the Vegetable show will be held in this park in the month of May for the visitors. The Pomological Research Institute and The Pasteur Institute which produce Anti-Rabi vaccine, DPT, DY and IT are located very close to this park. Visitors can visit this park from 9.30 A.M. to 4.30 P.M. in all Weekdays. Wax Museum, Ooty: this museum is situated 2 Km. away from the Ooty city. This museum includes lifelike wax statues of Mahatma Gandhi, Mother Teresa, Gopala Krishna Gokhale, Bal Gangadhar Tilak, Dr.A.P.J. Abdul Kalam etc. The Wax museum also has the replicas depicting the culture and Indian way of living particularly villages. The depiction of Pottery and Farming of villagers is a wonderful site of this Wax museum. The Wax Museum will be opened for visitors from morning 9.00 A.M. to 8 P.M. in the evening in all days of the week. The entrance fee is Rs.30 per head for Adults, Rs.20 for children, 50 per camera for still photography, Rs.100 for camera video-graph. Mudumalai Wild Life Sanctuary: This Wild Life Sanctuary is located 33 Km. away from the Ooty City.This sanctuary mainly hosts elephants in large number. Other animals like Gaur, specimens of Chital, Sambar, Bengal tigers, Indian Leopards, and other threatened species can be found in this sanctuary. There are 266 varieties of birds reside in this sanctuary. Some critically endangered species like a long-billed vulture and white-rumped vulture are also can be found in this sanctuary. The Sanctuary will be opened for visitors from morning 7.00 A.M. to 9 P.M. and 3 P.M. to 6 P.M. in the evening in all days of the week. The entrance fee is Rs.15 per head, 25 per camera for still photography, Rs.150 for camera video-graph. Ooty is well connected with Air, Train and Bus services. The nearest Air Port from which Ooty is connected is Coimbatore and Banglore. Coimbatore Air Port is 88 Km. and Banglore Airport is 295 Km. away from Ooty. Mumbai, Delhi, Chennai, Hyderabad are well connected with both Coimbatore and Banglore. One can easily hire Taxi to reach Ooty from these Airports easily. Regular Air services are there in all the weekdays to these two cities from all over India. The nearest Railway head center to Ooty is Mettupalayam. Frequent daily train services are there from Chennai, Mysore, Banglore, and Coimbatore to this region. There is good Bus services are there both Government and Private side. Government and Private bus services provide reasonable package tours to the tourists. They provide accommodation facilities in good hotels as well as food facility for the tourists in this package. Food and accommodation facilities are easily available according to our budget and tourists find more comfortable with this aspect of the tour.